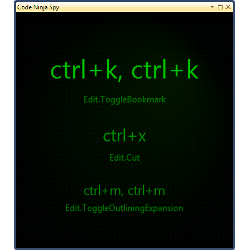 Look over the shoulders of a code ninja and see what shortcut he uses. This tool loads all Visual Studio shortcuts. When you press one, the key combination and the Visual Studio command will be displayed. So you can look over the shoulder of a skilled co-worker and learn from him the shortcuts he uses. The last 3 shortcuts are shown. If you have any suggestions, feature requests or find bugs, contact me via Twitter (@papaMufflon) or via GitHub, where this piece of software is available also (http://github.com/PapaMufflon/CodeNinjaSpy).